In a recent decision, the Gujarat police refused permission to hold a public meeting to highlight exploitation of construction workers in Gujarat next to one of the biggest real estate projects of the state coming up on way to Gandhinagar. The letter denying the permission to hold dharna issued by the Gandhinagar police reads, “Since the session of Gujarat Assembly is on, we cannot grant you permission, for it can disturb law and order situation in the state.'' 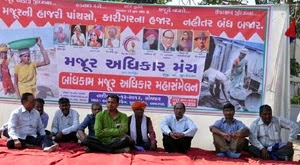 The dharna was planned by the Majur Adhikar Manch, which is affiliated with the Gujarat Federation of Trade Unions. The dharna was not just meant to protest against the plight of workers at the Adani-sponsored Shantigram project, which was chosen as the site of the protest, but also their brethren across the state. In an answer to a right to information (RTI) application, the Government of Gujarat has said that during 2005-13, a total of 337workers died in the state in accidents at various construction sites. However, only seven of these have so far received compensation from the state-supported welfare board. The Majur Adhikar Manch had filed an application for permission to hold a public meeting on July 6 at Khoraj over-bridge, next to the Adani Shantigram, which falls in Gandhinagar district, to raise the grievances of workers employed at the site. Spread over 650 acres of land, Adani Shantigram is a mighty project where 20,000 apartments are under construction, apart from golf courses and entertainment parks. According to sources, more than 6,000 workers, most of them inter-state migrants, are working day and night at the site. Complaints were received that their working conditions are horrible and they do not have basic civic facilities. It is learnt that most of the workers are denied minimum wages and are forced to toil for up to 12 hours a day. Insiders allege, the workers who lost their lives inside the site during work have not been compensated as per the Workers’ Compensation Act. The Majur Adhikar Manch raised all these issues before the Gujarat government’s labour department and the Adani Group during the last few months, but there appears little change either in working condition of the workers or in payment of wages. The Majur Adhikar Manch even today receives cases of workers who are threatened of dire consequences when they ask for the payment of higher wages. According to information with the Majur Adhikar Manch, not a single worker is registered with the Gujarat Building and other Construction Workers Welfare Board despite a categorical order from the High Court of Gujarat asking all the private employers and the welfare board to register each and every construction worker, and implement the welfare schemes meant for them. Even a complaint was made regarding this with the Labour Commissioner’s office seeking his intervention in the matter. The authorities made a site visited and came up with a convenient report which said that there is not a single worker who is denied minimum wages. However, workers have told Majur Adhikar Manch activists that even the workers whom the labour department met to check whether they were given minimum wage were not enrolled with the welfare board of the state government. Board has been set up to collect Rs 500 crore from builders as cess for the benefits of the workers.